Welcome to my Lounge and Dining Room Tour January 2013! 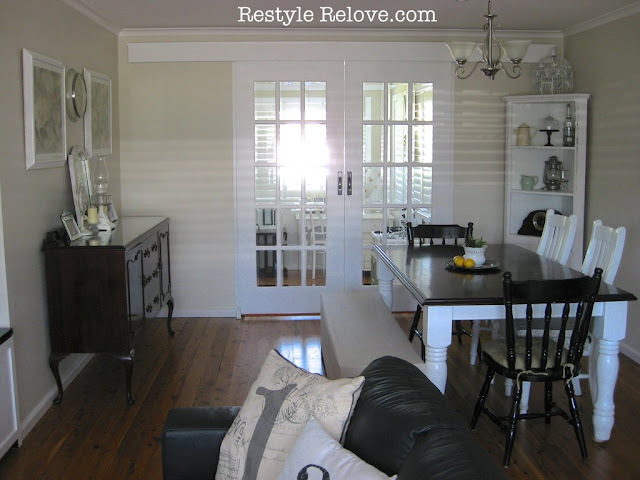 I'm so excited to show you my restyled lounge and dining rooms. 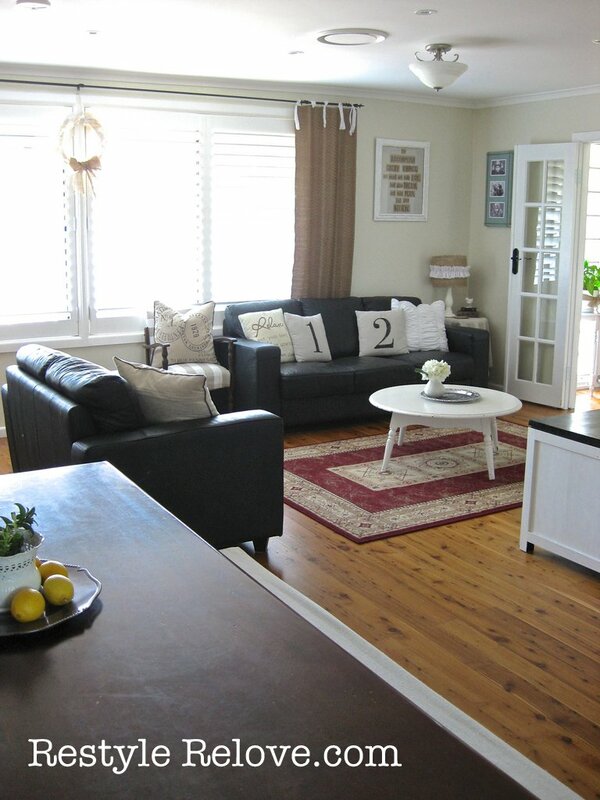 Almost all the items in these rooms are either hand made/DIY, restyled or re-loved. I love the ambiance of these rooms and hope you do too. 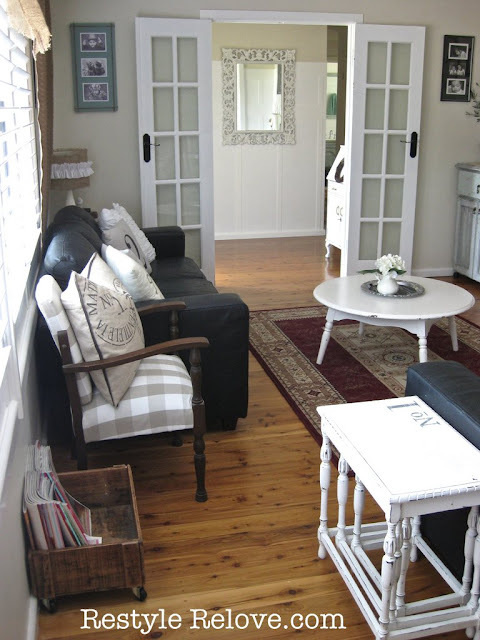 As you enter the lounge room you pass through our French doors. They were originally plain wood and I repainted them white. Almost everything in this next picture was DIY including the cushion covers, the drop cloth table cover, lamp shade, curtains and wall print. The corner pedestal side table was a yard sale find. The leather lounge we purchased new about 3 years ago. I originally purchased the lamp new and have just recovered the shade. 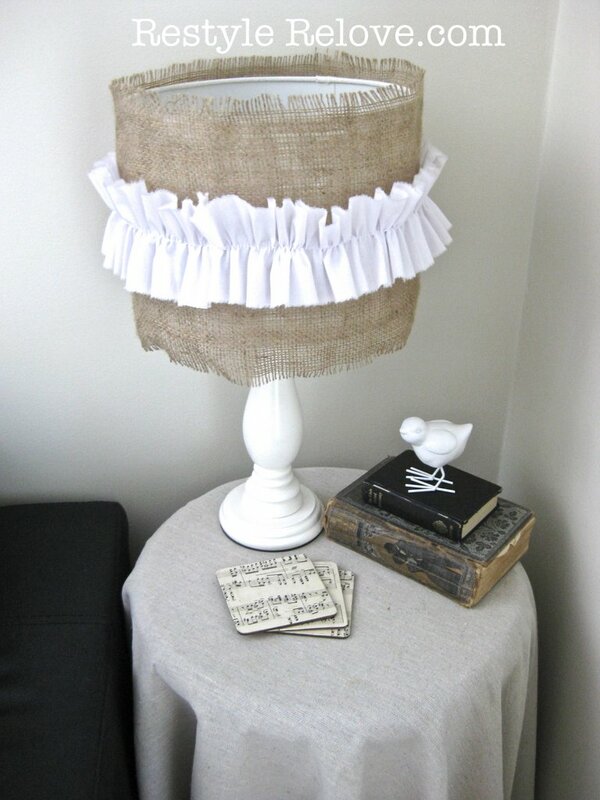 I used scrap burlap and scrap sheet fabric. My adorable little birdie was purchased new and is one of my favourite things as it looks good where ever you put it. I also recovered some drink coasters I bought new at the Cheapie shop using old sheet music and Modge Podge. The large book on the table is a very old edition of Little Women and Good Wives, and the smaller one is an old Oxford Dictionary that I got at a Church sale. For this art work I used an old picture frame and repainted it white and did some distressing. I covered the background with drop cloth and printed my wording on brown paper and stuck them on. 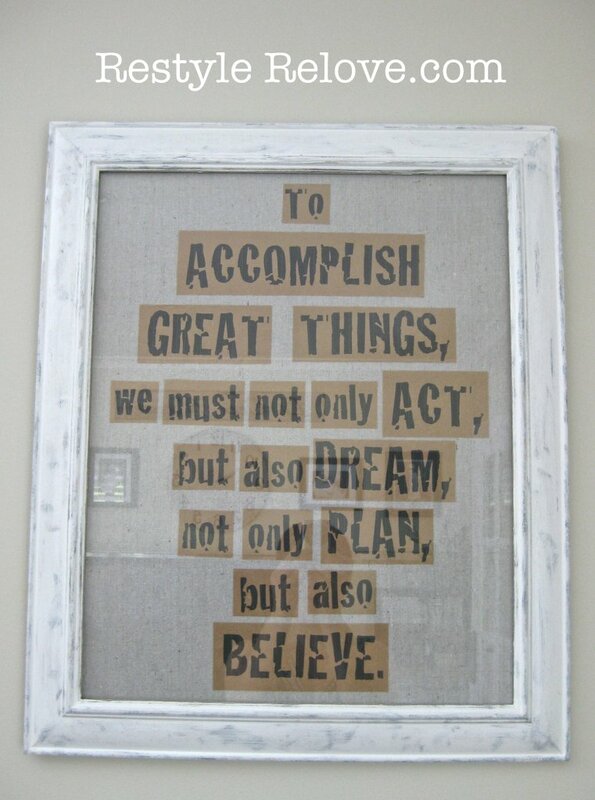 I love how inspirational this saying is. 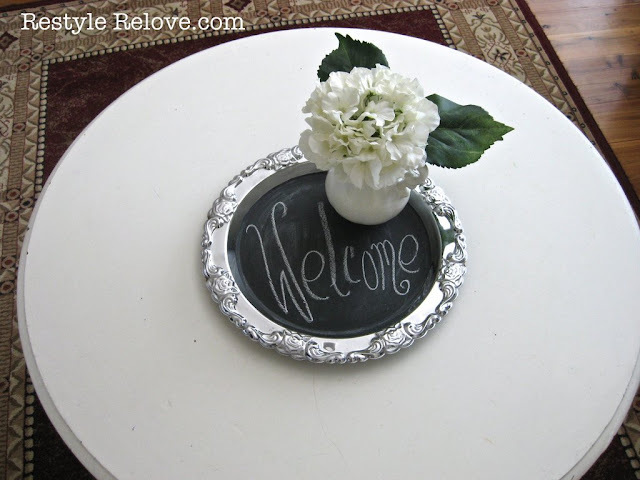 I picked the silver tray up at a yard sale and gave it a coat of DIY chalk paint. It rests on my gorgeous white chippy round wooden coffee table. I wanted a coffee table like this for ages and finally found this one at a yard sale cheap. 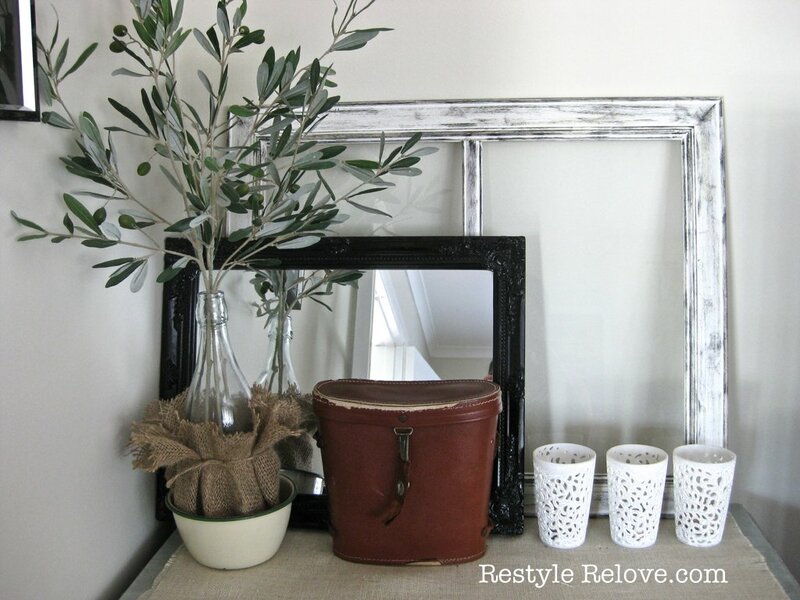 The small jug vase was a charity store find that I spray painted. 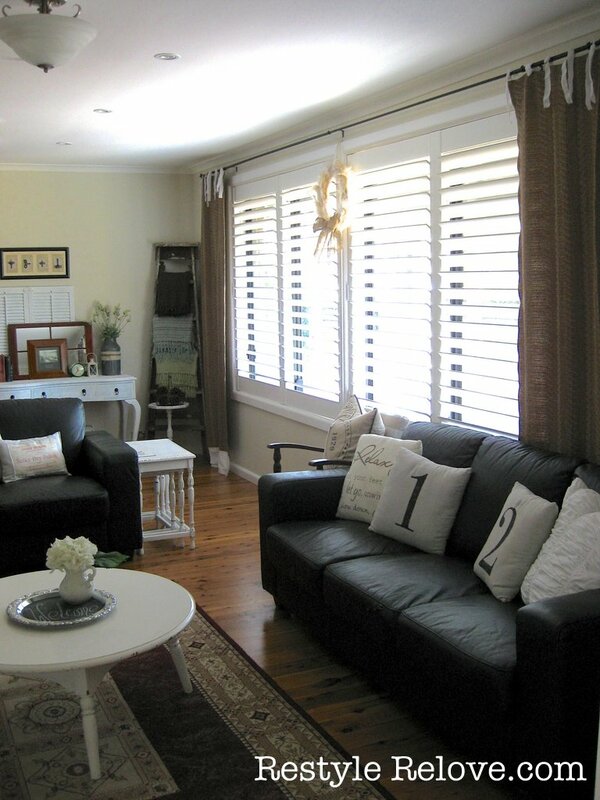 I love our white Plantation shutters. They let in so much light. The feather and burlap wreath I made at Christmas and have kept it up because it is so pretty. Everything on and under the table were yard sale finds except the milk can which was 70% off at Freedom. The old clock key artwork on the wall I created using an old frame, old book pages and genuine old clock keys my father gave me. The little aqua metal clock is a favourite of mine, as is the framed sketch of Bridge Street, Sydney in 1887. 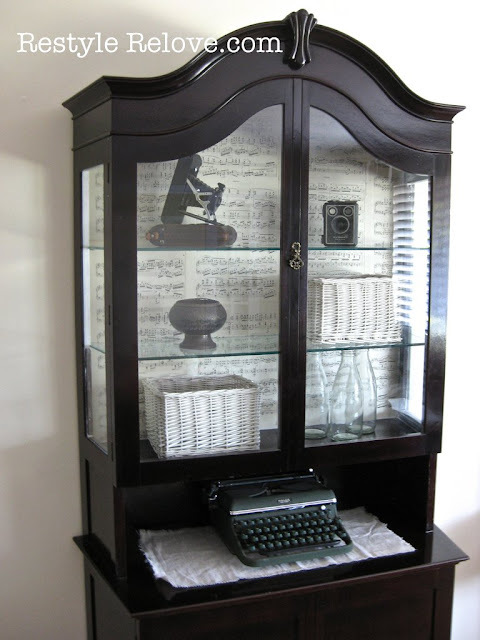 The gorgeous display cabinet was an eBay purchase and was handmade by the seller's husband many years ago. I re-covered the back with old music sheets. The old cameras, old mik bottles and old typewriter were all yard sale finds. And this is my newly restyled dining room. 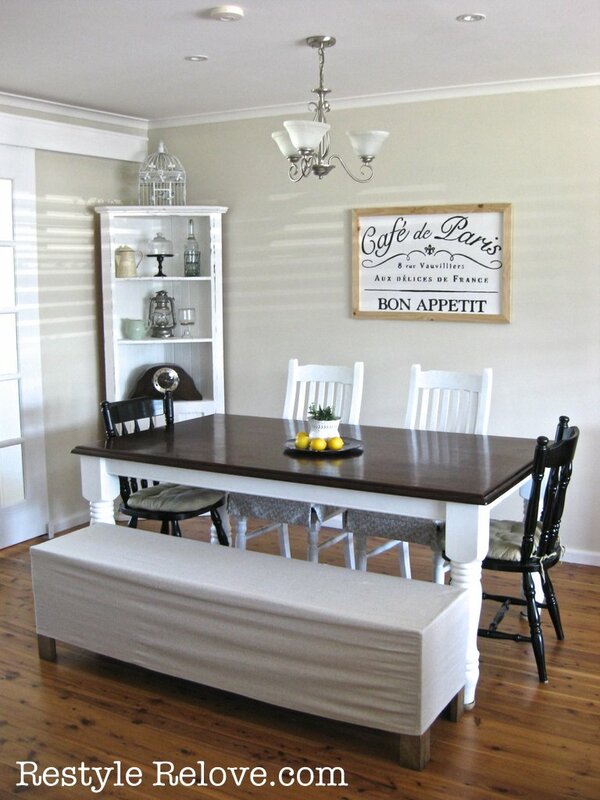 We purchased the table and white chairs about 3 years ago new and repainted them white. The black chairs were from eBay and were resprayed black. 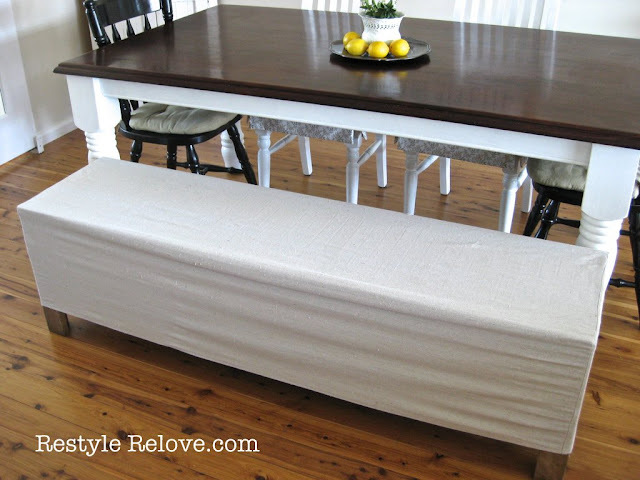 The bench seat is from our outdoor setting and I sewed the drop cloth cover. I just finished this sign for the dining room yesterday. I used a sheet of MDF and painted it semi gloss white. Then stenciled on my wording in pencil and painted in the words. I then used some spare strips of wood to make a frame. I like how it looks a bit like a whiteboard. The tray on the table I got at an after Christmas sale for 75% off. The vase was a yard sale find that I spray painted. And the old clock in the back ground was from my Dad. 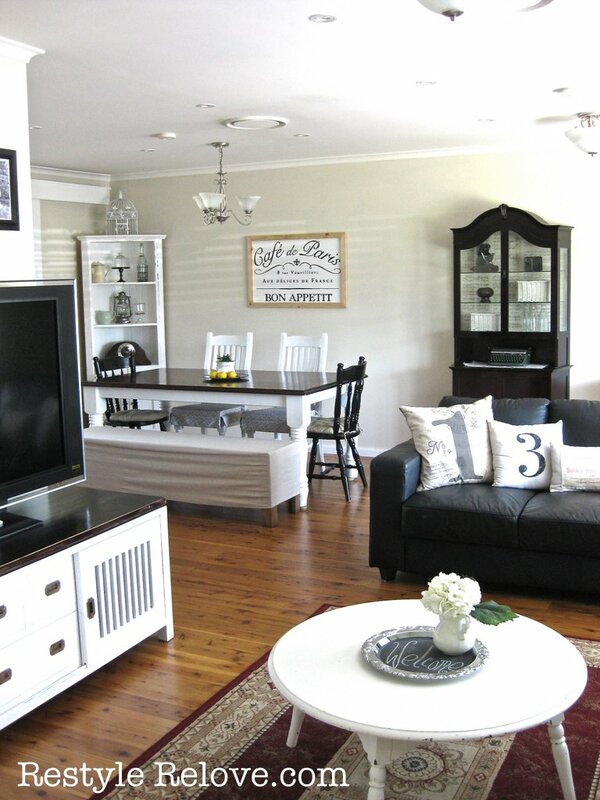 I also painted the sliding doors and frame white from their original wood colour. The corner wooden shelf unit was an eBay purchase that I repainted. The trinkets on the corner shelf are all from yard sales or charity shops. 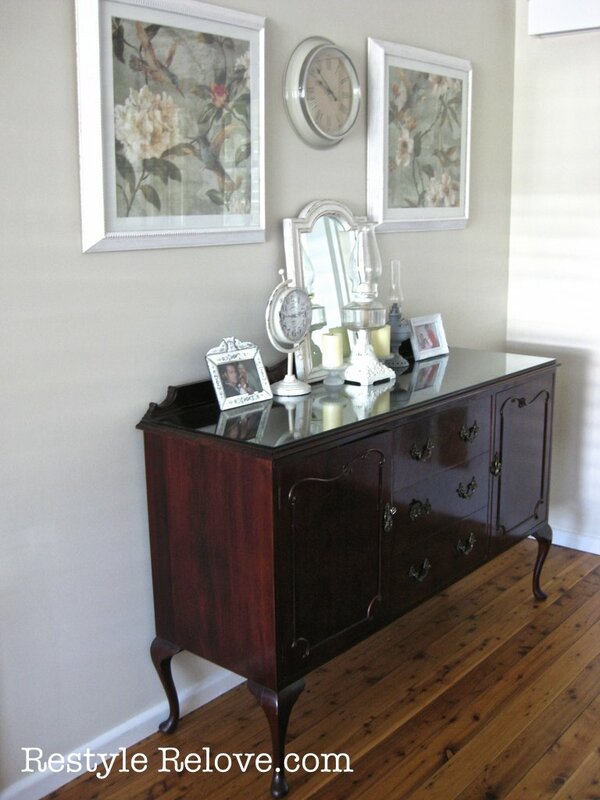 The hutch was also an eBay purchase. The prints on the wall were a Target on sale purchase. I splurged on the clock at Ikea just before Christmas. The old oil lamps were given to my by my Dad. 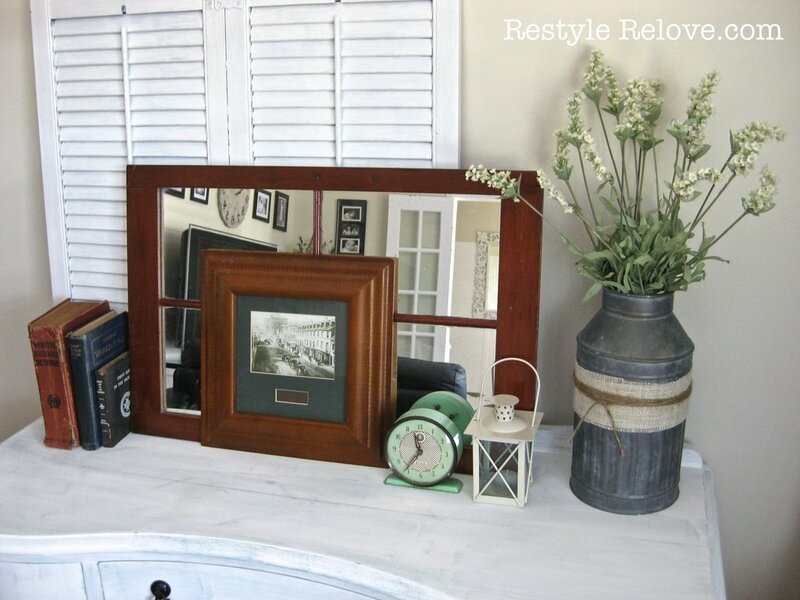 The mirror behind was also a yard sale find and was repainted and distressed. I repainted the walls a week or so ago in Dulux Hog Bristle Half Strength and totally love it. The TV cabinet was purchased new a few years ago and I repainted it white. The TV is a hand-me-down from my brother. 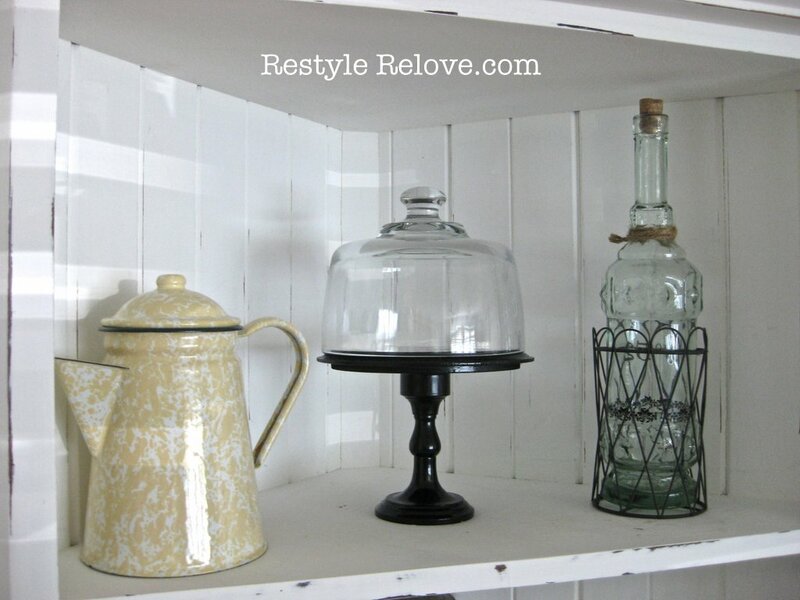 The corner cabinet was a yard sale find that I repainted and distressed. The pictures of the kids are all framed in old frames that have been spray painted black. The clock was a big splurge at a cute shabby boutique a few years back. 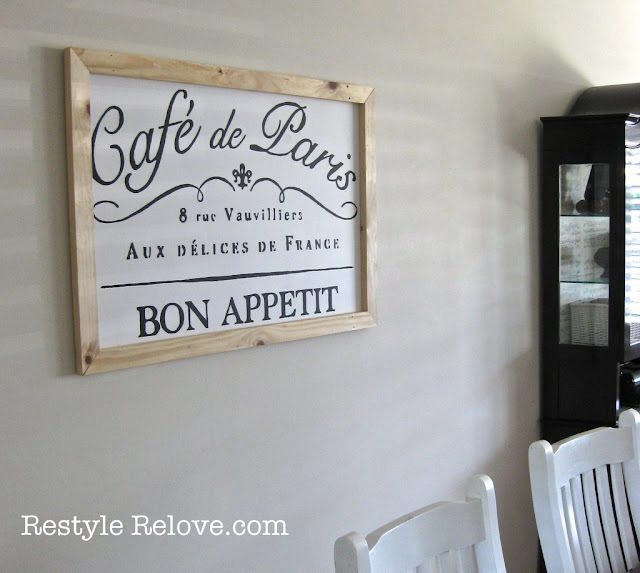 While the French sign above was a recent DIY project. 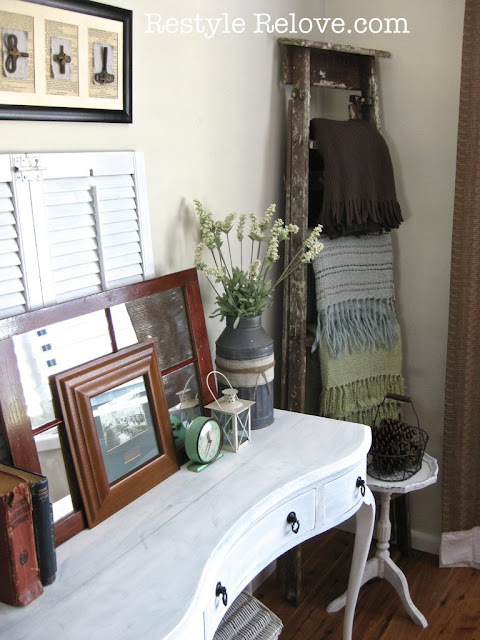 The white window frame is a faux DIY and the black mirror was on mark down. The bottled olive branches were also on mark down at Target. 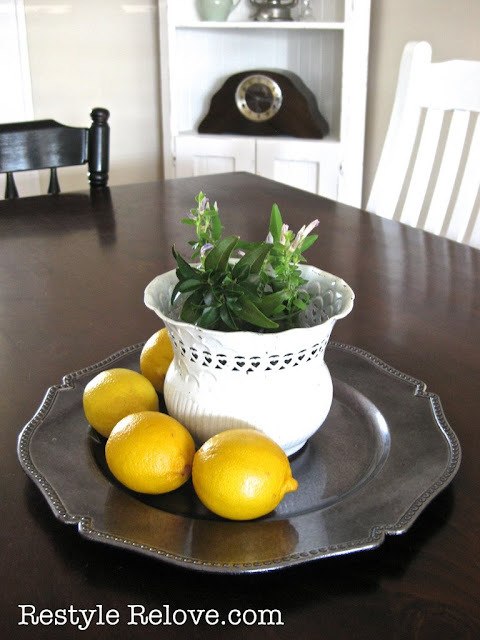 I added the burlap to the base, and the chippy porcelain bowl was a yard sale find. The old binoculars were also a yard sale find. And the candle holders were a gift. The cute white nesting tables were an eBay purchase that I repainted, distressed and stenciled with numbers. The brown check parlour chair was a yard sale find which I recovered with new fabric that I scored at a Church sale cheap. The cushion is from Target, when they had 40% off. 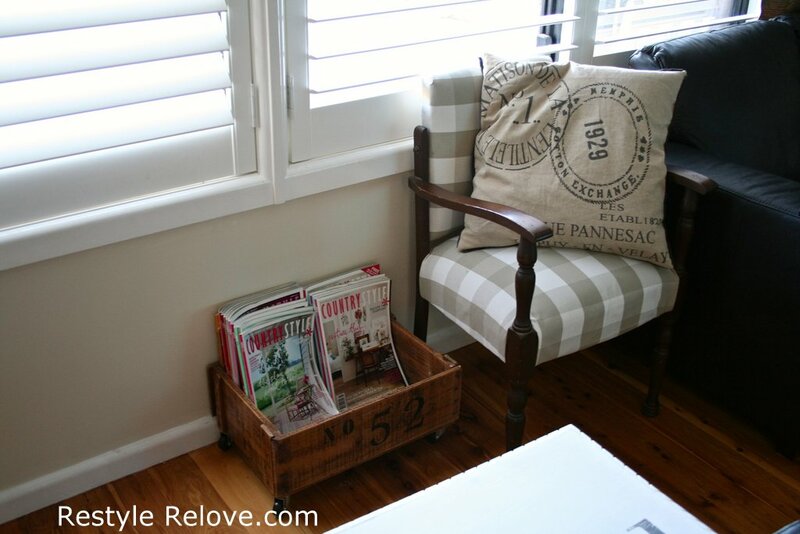 The numbered crate on wheels was restyled from a free old used crate to hold magazines. Please post a comment. I'd love to know what you all think of my restyle. I loved looking at your home. It is just lovely. I saw so many great ideas. What a beautiful tour Julie!Your home is lovely! I absolutely love it! I'm so happy to see you used re-styled items and LOVE the black with the white!!! Your rooms are lovely! 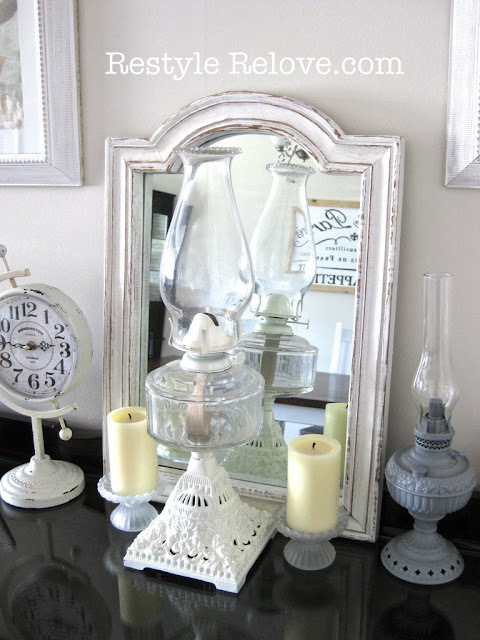 Pretty vignettes and great rescued and reloved pieces too. Thanks for your lovely comments Elizabeth! I love the dining room in black and white. 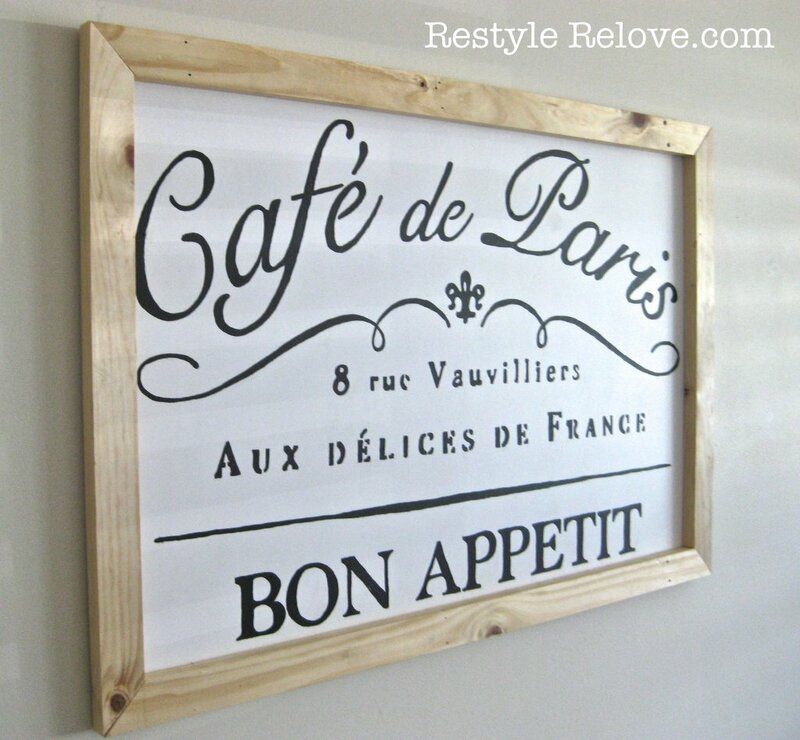 The sign you stenciled is awesome. Think i am going to try it. Your home is lovely and sooooo neat and beautiful. can you come decorate mine! Pretty Please. Wish I was as talented as you. But you have truly inspired me, and have given me many ideas . Thanks Julie. it's all looking so lovely! i especially LOVE your black ebay display cabinet - so lovely to have met the people who made it! Thanks for finding my blog now I have found you. 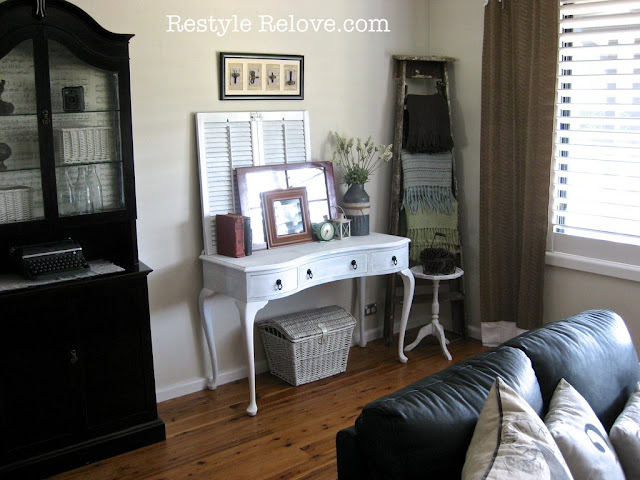 I love your blog and the restyle of your dining room and lounge!!!! Ohhhhhh I love every picture. I am putting you on my fav blog list my dear. Love your style. It is cozy and warm and so inviting. Love it all. One picture is better than the next!!!! I absolutely love your room! The mix of neutrals with all the black is just great and I especially love your curtains and how you styled that black hutch. Following your blog. What a beautiful space!! Can I move in? 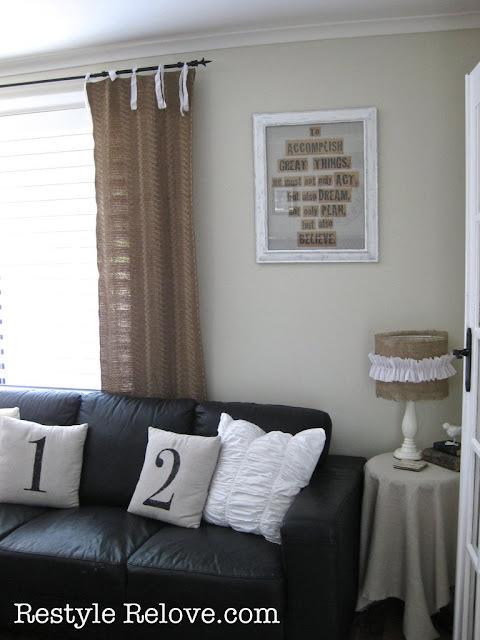 I love your colors, your great framed quote, and your number pillows. I bet you love spending time in there. Thanks so much for sharing!! this is all so fabulous, julie! 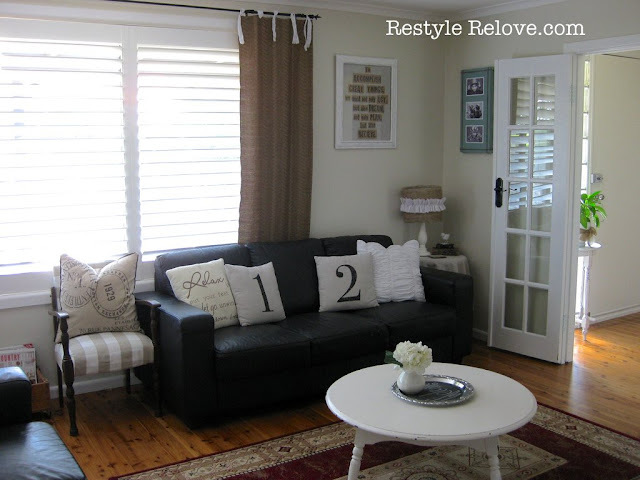 i love the framed print over your sofa, esp:) so many wonderful projects--love your style! Looks amazing! You have a beautiful blog. I'm a new follower!